NETWORK FINALS: A couple of notes: because the PRESIDENTIAL DEBATE aired without commercials, it’s not included by Nielsen in their final broadcast numbers. Also, it appears that FOX didn’t air national analysis after the Debate, and the number we had for that this morning was the combination of ratings from local affiliates. 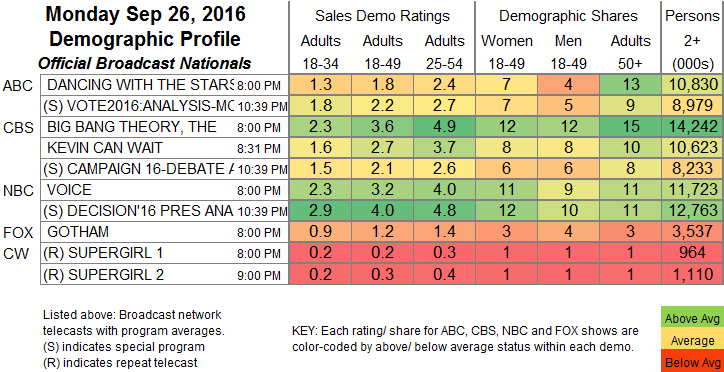 Elsewhere, THE BIG BANG THEORY gained 0.1, and THE VOICE lost the same, as did the 8PM SUPERGIRL rerun. In terms of the post-Debate analysis half-hours, NBC and CBS each rose 0.1, and ABC dropped the same. CABLE HIGHLIGHTS: Even though the PRESIDENTIAL DEBATE aired on many networks, the CNN telecast alone managed to beat MONDAY NIGHT FOOTBALL (as well as all the broadcast networks except NBC) with 3.55. As for MONDAY NIGHT FOOTBALL, ESPN suffered a crushing 1.44 drop from last week, as millions chose a different spectator sport. Back to the Debate, as is usually the case, FOX News was considerably behind CNN in 18-49s at 2.35, but ahead in the older-skewing Total Viewers demo (11.4M vs. 9.9M), and even more so in the 50+ group (7.1M vs. 4.3M). CNN also had the edge in post-Debate commentary among 18-49s, 2.18 vs. 2.08, but was behind in Total Viewers at 10M vs. 6.9M. A live post-Debate DAILY SHOW on Comedy Central was at 0.35. The only non-Debate, non-football telecast to hit the night’s Top 10 was VH1’s LOVE & HIP-HOP, down 0.07 from last week to 1.05. USA’s WWE telecast was at 0.97/0.79/0.74 (the first hour aired before the Debate began), compared to last week’s 0.93/0.91/0.90. On MTV, TEEN MOM was quite stable, down 0.03 to 0.66, with MARY & JANE down 0.03 to 0.19, and LOOSELY EXACTLY NICOLE down 0.02 to 0.11. Bravo’s REAL HOUSEWIVES OF ORANGE COUNTY dropped 0.11 to 0.56. 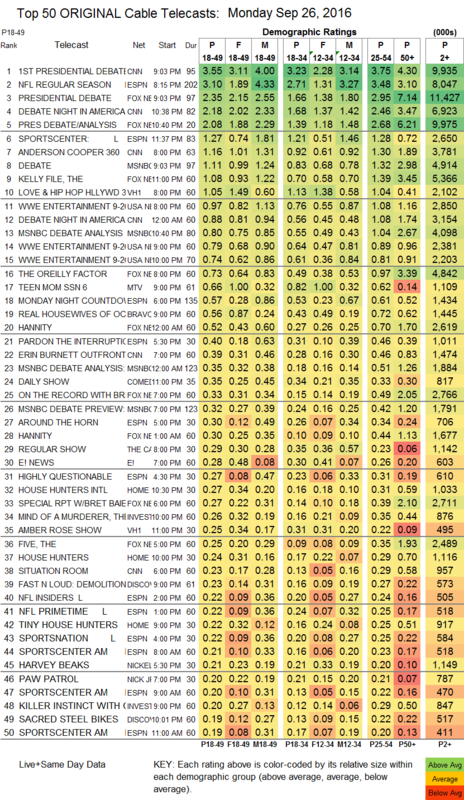 On HGTV, HOUSE HUNTERS INTL held at 0.27, and HOUSE HUNTERS was down 0.03 to 0.24, while TINY HOUSE HUNTERS remained at 0.22. On Discovery, FAST N LOUD: DEMOLITION plunged four-tenths from last week’s regular FAST N LOUD to 0.24, and SACRED STEEL BIKES was down 0.13 to 0.19.